Ancestry member since May 2004 - My Tree Blaschko-Eaton-Pereira Cardozo-Perry-Wilson requires Ancestry Membership to view. Having met my Father Richard Newton Young for the 1st time 1968, I began researching 1992, on the assumption my Surname was Young, only to learn in 1994, that my biological Father was born Newton Richard Begnal, realizing no records gave validity to my Grandfather being born Clifford Franklin Begnal, 31 Mar 1903, Utica, Oneida Co., NY. Thus My Surname Search for Young, swung to Begnal for the next 24 yrs. 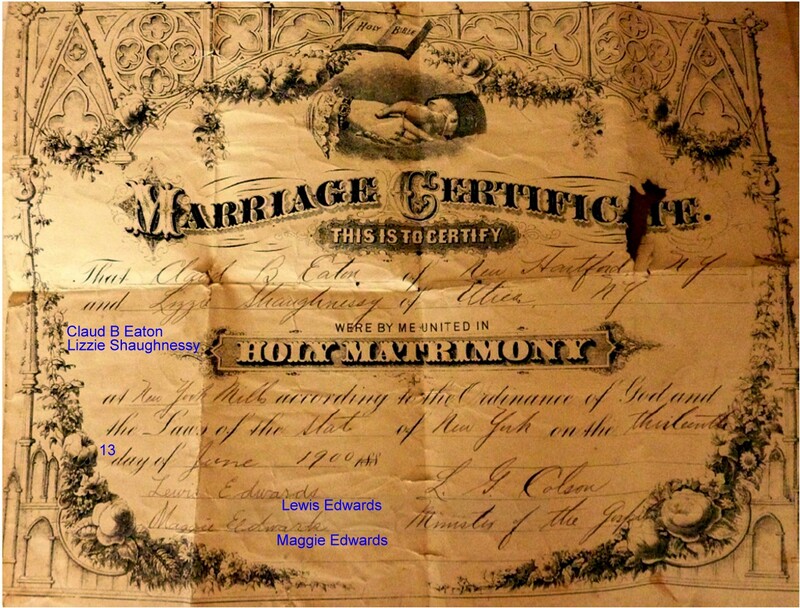 1910, the Surname Begnal assumed by Elizabeth nee Shaughnessy, indexed as Mrs. George and then 8 yr old son Clifford F. Begnal for the first time. I have extensive Records & Time-Lines for Elizabeth Shaughnessy, George Felix Begnal (1879-1957) and Clifford Franklin Begnal (1903-1960) other events and documents are linked on these pages as well. Thus indicating that Claude Brudenell Eaton (1879-1956) a very strong possibility of being Clifford Franklin's biological father. Per NY Health Dept & Utica Vital Statistics Records in 1994, no birth of a Clifford Franklin Begnal recorded. I have not re-written NY Health or Utica Vital of a birth for Clifford Eaton, 31 Mar 1903. 2016 - AncestryDNA results as of 13 Dec 2016 and I also submitted to GEDmatch (#A476709 Donald Richard Young) Gedcom Resource #9648706 as of 2018-04-29 (aka D.R. "Doc" Young) as of 1 Dec 2018, my DNA has yet to connect with Eaton, or any other Surname. "Who Am I Really?"